During university, it was often quite easy for me to lose track of myself, because of the continuous heavy University and/or work-related tasks that I needed to complete to for a certain deadline. My second year at university really overwhelmed me, to say the least. I found myself juggling so many tasks to the point of mental and physical exhaustion all leading to uncontrollable anxiety. Once exams were over, it was strange but my anxiety never left. For the past month, I’ve been battling it by opening up about it to the lovely people around me like before. I wanted to try new ways to help myself because I felt bad relying so much on calling and messaging people at 3 am in the morning and I really wanted it to not have such a big impact on my life. I started researching self-help methods to reduce anxiety and meditation was one of the first things up there. Initially, I was sceptical. As my friends have described me before: I’m a real life Monica – who cannot relax no matter what; asking me to spend a few minutes of meditation a day to help “calm” my constantly intense ticking mind sounded so difficult that I almost just abolished the whole idea. But as I researched further, I found I could do it at home, by myself and with the help of an app. 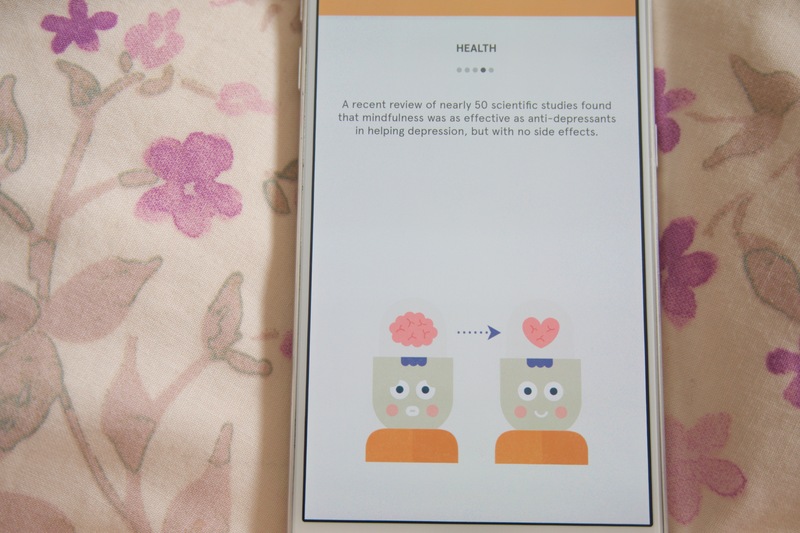 Mimi Ikonn recommended the app Headspace. Take 10 is a meditation session that lasts only 10 minutes for 10 days. I decided to give it a try. From the first morning, I tried it, I was pleasantly surprised by how listening to a person (with an extremely calm voice) could take all the muddled worries in my thoughts, put them in line and ease the restlessness I felt that night. Yes. I felt calmer, more in the balance of my thoughts after each session. I tweeted about it each day for 10 days. Tiny May told me about another mediation app called Calm. Feeling more open-minded about trying to really learn about mediation, I downloaded the app and participated in the 7 days introductory meditation. Calm is a little different to Headspace as you can actually listen to “calming” sounds like an open ocean or rain on leaves. But similar in that there is a voice that helps guide your thoughts to focus on breathing. I really enjoyed the sounds available on the app, it put me to sleep almost instantly when I had it on at night and I didn’t wake up at unreasonable hours of the day. Marking Progress wrote a blog and has a video reviewing Calm, I agree with every point he had in comparison to Headspace – check it out here if you’re interested. I did meditation every morning. Initially doing it for 10 minutes but gradually increasing it to 20 minutes, I really enjoy it and will most likely extend this time as I progress further. Below is a really great video by Calm that summarises mediation for me so far and the benefits of them. Whenever I feel anxious throughout the day or in the middle of the night, I take a second to breathe, to calm myself down using techniques I learnt practising meditation and then in my own time resume what I was doing or slowly drift back to sleep. I still have a lot to learn, but just like going to the gym (but this time, brain gym? ), I’m determined to see results by being constant. In the busy, the more disconnected world we live in, anxiety is bound to creep up in your life. Sometimes we need that little breather (or our own Baymax) – give mediation a try! Have you tried meditation before? What are your thoughts on mediation? Meditation has taught me so much about my self and it has pretty much made more aware of my own fears/anxieties/negative self-talk. I’m actually getting close to my one year with using my Calm app and will not hesitate to pay for another year’s subscription. Kudos to you for doing this! I think it’s great these techniques have been working for you. It’s great you’re able to relax your mind. For myself, I find that meditation does jack for me T_T No matter how much I try, I cannot relax my mind because it’s constantly going somewhere! Maybe one day I’ll achieve it . . . but I don’t like listening to people talk much, either. In fact, because of my hearing problems, their voices tend to go over my head because it’s a struggle for me to concentrate and listen to them. This is one reason why I much prefer pilates over yoga! I’m so glad you find meditation to be so beneficial. My second year was also pretty rough and after noticing an increase of panic attacks and anxiety, I decided to visit a therapist at my school. He’s the one who recommended meditations and even referred me to a site where I could listen to some. And they definitely worked wonders. Especially when it comes to falling asleep. I haven’t been using the meditations recently but I think I’ll probably try and get back to listening to them. I do meditation before I go to sleep and have the calming noises in the background as I sleep, it really makes me fall asleep like a baby! I’m glad to hear its worked for you. I hate anxiety! x_x It can be so hard to deal with. Mine has increased over the last couple years. I used to do some meditation, really should go back to trying that. Might have to try these apps! I saw your meditation tweet! I hope you’re finding it useful and beneficial – I don’t think I can live without it now! I wish I could do this, :/ thanks to my mental illness, it’s difficult to actually keep a clear head. I think everyone’s minds are constantly busy, but meditation practise helps declutter the thoughts. Do give it a shot if you can Michelle! I’m not sure why, but I get random bouts of anxiety more now than before. I find that meditation helps too. Sometimes when I can’t sleep, I’ll sit up in bed and meditate to clear my mind before trying to sleep again. I don’t do it every day, but that sounds like a good daily habit to have! Working out more has also helped me out. I’m interested in these apps! Thanks for the recommend! I’m glad to hear that they work for you too Cat! No problem, these apps are very useful! 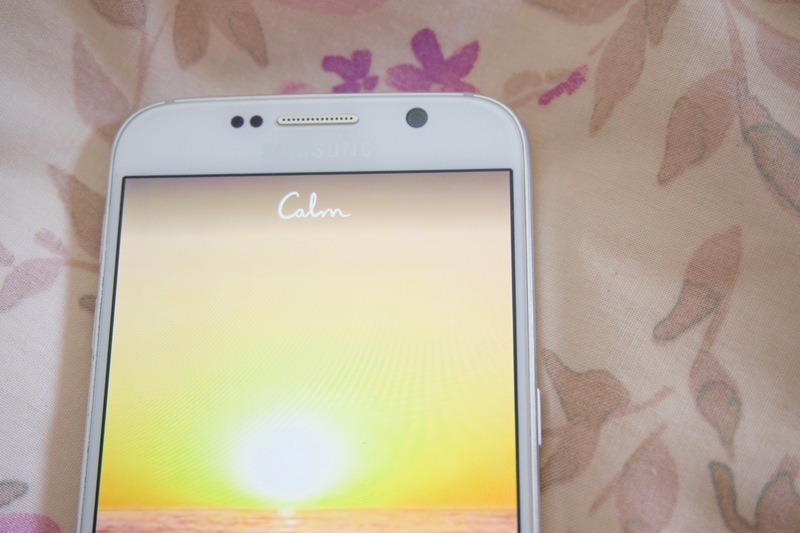 Oh I’ve tried the calm app before but I deleted it because I realized i dont really need it that much and i switched to doing yoga every morning. It’s a great form of exercise plus relaxation. Also I am happy that you are taking control of your life and actually trying make your life better. Keep it up! Anxieties are here to stay but if we find ways to counter them then it no longer has power over us. You go girl! I just started yoga after meditation – it’s actually amazing! I really wanted to control my emotions because I felt that over the past year they were clustered everywhere in my brain. I like how there are so many apps out there that are meant to ease your mind and soul! I heard that listening to sounds such as rain at night helps you get into a deep sleep. 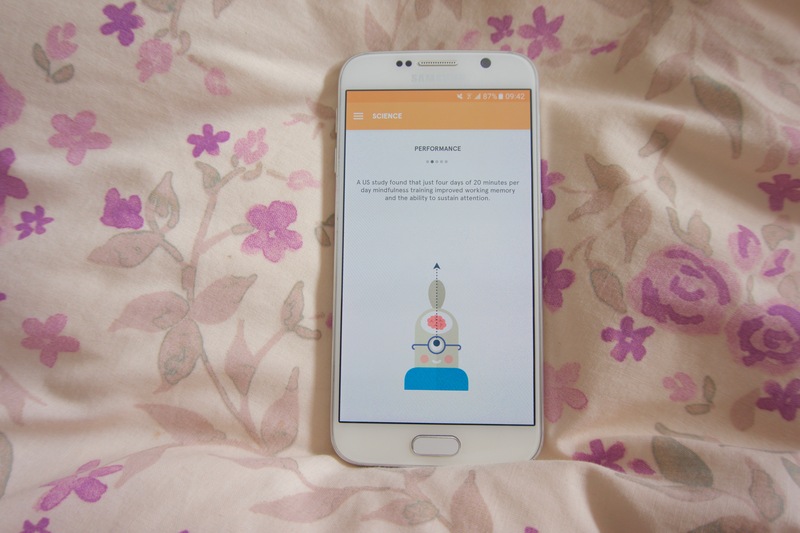 Glad to hear that this app has been working for you with reducing stress and keeping you focused! Hope it’ll keep your stress and anxiety levels at a minimum :)! It definitely does! I sleep like a baby now for sure! Yeah! I heard that very successful business people practise it too, it’s nice to hear it works! Btw I like your pretty theme. I left you a comment on your site. I’ve seen your Zen art before I think. I’ve tried something similar and my sister actually finds drawing and releasing her artistic capacity as calming and relaxing in contrast, for her, meditation and yoga. I definitely am inspired by bloggers (like you) who really commit to a goal and do something about it! Hey, I’m back from the dead! Haha. I’m sorry to hear that you’re suffering through panic and anxiety now as well! Anyways, I’ve actually tried meditation before and it does help reduce anxiety, which numerous things can set it off. However, the one meditation that I’ve found meaningful and helpful is Thai Chi Chuan or Thai Chi. It’s supposed to level growth and elevate your heart rate. Another thing that I found peaceful to do if I’m ever stressed out is walking and listening to calm music. Definitely do! It’s so beneficial and doing it everyday now for more than two weeks has relaxed me more than I thought was possible, haha! I’ve never tried meditating before but I would love to give it a go. I love doing yoga and I find that it really helps with my anxiety, and I guess that’s because it’s all to do with breathing too. I’ve started yoga too Holly, I think the super combo of both is amazing! I know a couple of people who really love doing meditation and incorporate it in their day-to-day lives. I think it’s fascinating how great smart phones are, in that we can utilize apps to help decrease stress and anxiety levels. I’ve never thought about doing meditation but after hearing about how it has helped you, I want to try it at least once! Tell me about it Rezina! I find my phone amazing and sometimes I stop and wonder how much more it’s capable of – I’m waiting for an app that transforms my phone into Baymax, my own personal healthcare assistant. LOL. This is something that I have been trying to work on, but it’s so damn difficult to find the time to dedicate to breathing exercises, let alone full-on meditation. Eh, like I always say, hopefully it will happen eventually. I think what really pushed me was a change in mindset – more determined to make it work, you know? I have tried meditation before but used techniques from yoga. So I just closed my eyes and listened to some relaxing music and focussed on my breathing. More recently I tried to do just a few minutes a day, and then increase that, but I didn’t get stuck into the habit. I should try one of the apps you mentioned – I have heard some people recommend Headspace as well.